Citation Information: J Clin Invest. 1999;103(6):879-887. https://doi.org/10.1172/JCI6042. Because of the role of thrombin and platelets in myocardial infarction and other pathological processes, identifying and blocking the receptors by which thrombin activates platelets has been an important goal. Three protease-activated receptors (PARs) for thrombin — PAR1, PAR3, and PAR4 — are now known. 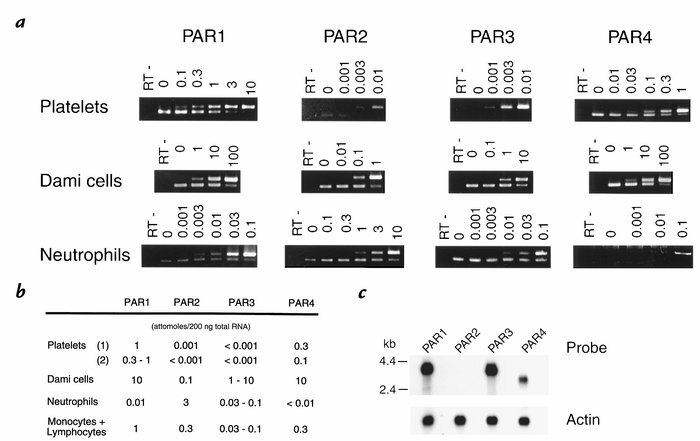 PAR1 functions in human platelets, and the recent observation that a PAR4-activating peptide activates human platelets suggests that PAR4 also acts in these cells. Whether PAR1 and PAR4 account for activation of human platelets by thrombin, or whether PAR3 or still other receptors contribute, is unknown. We have examined the roles of PAR1, PAR3, and PAR4 in platelets. PAR1 and PAR4 mRNA and protein were detected in human platelets. Activation of either receptor was sufficient to trigger platelet secretion and aggregation. Inhibition of PAR1 alone by antagonist, blocking antibody, or desensitization blocked platelet activation by 1 nM thrombin but only modestly attenuated platelet activation by 30 nM thrombin. Inhibition of PAR4 alone using a blocking antibody had little effect at either thrombin concentration. Strikingly, simultaneous inhibition of both PAR1 and PAR4 virtually ablated platelet secretion and aggregation, even at 30 nM thrombin. These observations suggest that PAR1 and PAR4 account for most, if not all, thrombin signaling in platelets and that antagonists that block these receptors might be useful antithrombotic agents. Expression of mRNAs encoding PAR1, PAR2, PAR3, and PAR4 in platelets, Dami cells, and neutrophils. (a) Competitive RT-PCR of total RNA from platelets, Dami cells, and neutrophils. Total cellular RNA (200 ng) mixed with the indicated quantity of competitor RNA (measured in attomoles) was reverse-transcribed and amplified. Products were digested with a restriction endonuclease to distinguish the products of competitor RNA (uncleavable upper band) vs. native cellular mRNA (lower band). RT indicates mock RT-PCR of total cellular RNA and the highest amount of competitor RNA with no reverse transcriptase added. Each sample was analyzed at least twice. Note that the single band seen in the platelet PAR3 RT-PCR is due to amplification of competitor RNA. (b) Quantitation of PAR mRNAs in platelet, Dami cell, neutrophil, and monocyte/lymphocyte preparations. Results indicate the range of values obtained from at least two experiments like that shown in a. 1 amol/200 ng corresponds to an mRNA relative abundance of roughly 1:3,000. The expression of PAR mRNA in the platelets of two unrelated individuals is shown. (c) Northern blot analysis of PAR gene expression in Dami cells. Blots were hybridized separately with coding region probes for PAR1, PAR2, PAR3, or PAR4, as well as with probe for β-actin mRNA as a control for lane loading. Note concordance with PCR data in b. PAR, protease-activated receptor; RT, reverse transcription.